Fits the 2000-2007 Toyota MR2, MR-S (Japan) and MR2 Roadster (Europe). 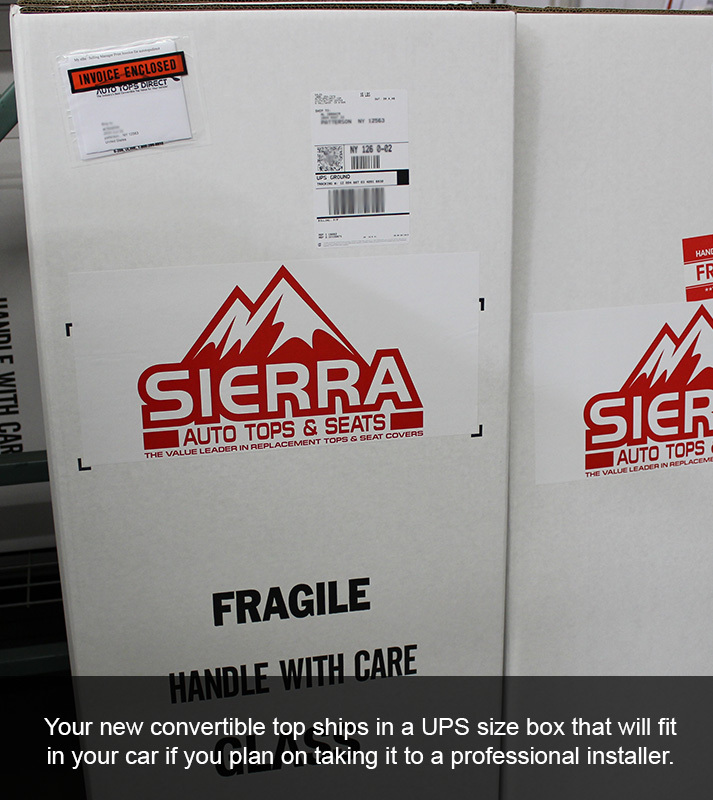 Replace your worn out Toyota MR2 convertible top with this premium quality Top from AutoTopsDirect. It include sewn-in plastic retainers for an easy, secure, and accurate installation and they have a new heated glass window. The glass windows are bonded using an advanced robotic controlled window bonding system that eliminates the stitch lines and piping commonly found on heated sealed tops or silicone bonded windows. The process virtually eliminates window separation and leaks. Due to some problems with tearing, Toyota redesigned the side hold down cables. This MR2 convertible top includes new installed sewn-in steel cables that meet the newer Toyota specifications. This AutoTopsDirect Toyota MR2 convertible top has been designed and manufactured to be the best aftermarket product available for your vehicle. Ready to install out of the box. You will reuse some brackets and components from your car. We recommend professional installation for best results. I am very pleased with the top so far. But I must say that the instructions were not particularly clear. There are quite a few differences in the straps, velcro and otherwise, between the new one and the original one. It would have been helpful if the pics provided a better perspective with arrows to show what was being referenced. By the way, I had to call to ask for the directions as they were not included with the order as requested. Kudos to Tony for sending me the instructions and for answering my questions regarding the recommended adhesive. I bought the top to replace an aging and ripped top. The looked fantastic out of the box. Even though it needed to have the brackets installed, it was an easy enough installation. I was surprised to find that the holes were not drilled out along the edge, but that was an easy enough remedy. A little adjustment and the top looks like it was original to the car. It is an excellent kit for first time installers like myself.